The Story of the sinking of the R.M.S. Leinster - The Kingstown (re-named Dun Laoghaire) to Holyhead Mailboat. On the 10th of October 1918 at a little before nine o'clock in the morning, the City of Dublin Steam Packet Company owned mailboat - the R.M.S. Leinster - left Kingstown (now Dun Laoghaire) on route for Holyhead. Three members of the Royal Navy manned 12 pound guns on board as a precaution. Including these three men there totalled 771 on board. Of these, 489 were military and 180 were civilian passengers. 22 Dublin Post Office workers and 77 crew accounted for the rest. An hour into her journey, a torpedo was launched by U-boat UB-123, which just missed the Leinster. A second torpedo struck the Leinster in the area of the sorting room, and just one of the 22 workers inside would survive. Captain William Birch - Irish, but living in Holyhead in a property named 'The Sycamores' - gave the order to turn the ship and attempt to get back to Kingstown harbour. The third torpedo struck amid ships in the engine room, causing devastating damage, and the ship began to sink. Survivors found themselves struggling in rough seas, and by the time rescue boats arrived 501 would have perished. 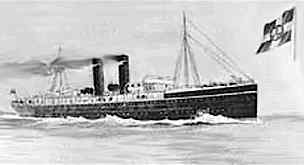 Following the war the City of Dublin Steam Packet Company could not financially recover from the loss of the Leinster and its' other ships, and in 1920 the Irish Mail contract was finally awarded to the companies rival for 70 years - the London and North Western Railway Company. You may not be aware that a seven year old George Formby was sent to Ireland to be trained as a jockey. As you may imagine, George was very homesick, and he had run away from the stables on many occasions. George planned to stow away on the R.M.S. Leinster and get back to England. He even sent a letter to his Mother telling her that he was coming home on the Leinster. Luckily for him and us, he was caught by the authorities and he missed it, but you can imagine his mothers grief when she heard news of the sinking. George did manage to get home on another boat just a few days later.